The Georgetown Hospital or "Sanctuary" climbing area is literally right behind the hospital in the river bed along the cliffside. 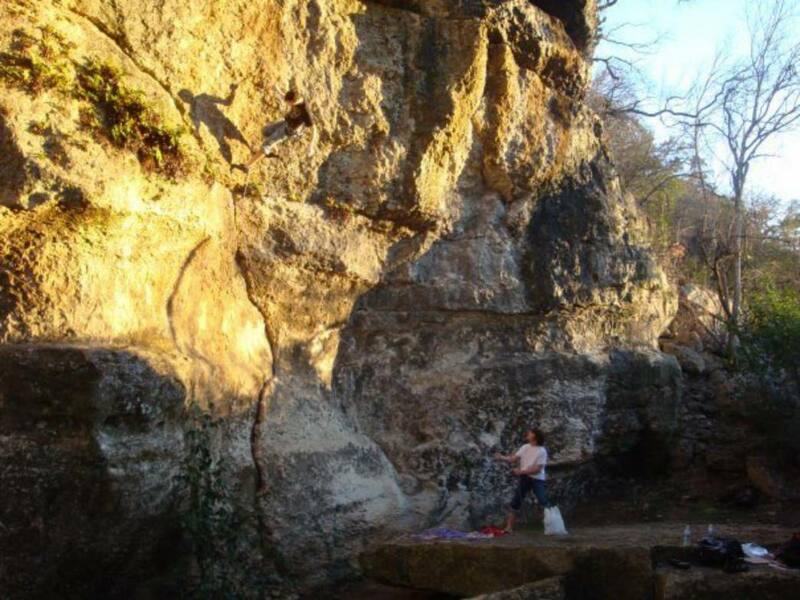 The crag is a fairly secluded climbing area, so you can typically have it all to yourself, which is nice. There are about 15 (or more) routes with easy-to-moderate bolted sport and top-rope routes and fixed anchors ranging from 5.8 to 5.12. This is a fairly new crag, having been bolted in 2002, so most of the rock is still fresh. But it can be a little difficult for those not used to the steep and smooth limestone characteristic of Texas, so keep that in mind. There is some beta information that can be found in the "Austin Rock" guide book by Sean O'Grady, but it is a small section. The shade of the trees here make it a nice, cool place to climb during the warmer months, and the nearby river gives you yet another outlet to escape the heat. Take a dip, do some climbing, and enjoy all that Georgetown Sanctuary has to offer! Below is a small list of climbs at the Sanctuary. The majority of routes here are bolted, intermediate, single pitch climbs, though there's some quality lines for experts as well. It's a fun place to relax and cool off in the summer months, thanks to the river. From I-35 N take the exit for Leander. Take the first left, then left once more to the Georgetown Hospital parking lot. On the south side of the lot, near a large antenna, is a trail down to the river and crags.